There’s nothing much I can tell you about Wood’s Rum Distillery itself because there’s not much online about it (and my books barely speak to the big names so what hope is there for the small ones? ), but the brand did exist for over a century before being acquired by William Grant in 2002 – these are the boys who also own Sailor Jerry and the OVD rum brands and supposedly dabble in minor whiskies like Glenfiddich and Balvenie (or so rumour has it). 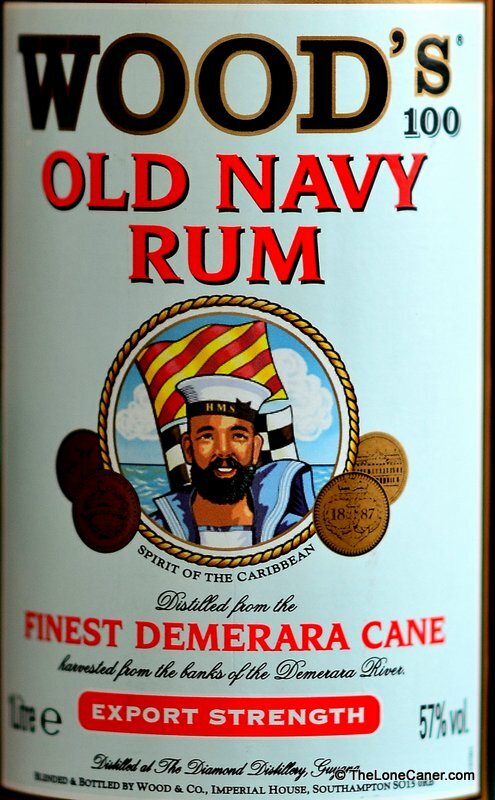 I wish, on the strength of what I tasted here, that I knew more about the company’s origins and how it got into the Navy rum market in days of yore. It’s perhaps kind of appropriate that I bought it at Heathrow, Britain’s largest modern equivalent to the old ports. The first noticeable, unmistakeable aromas that billowed forth as I cracked the cheap tinfoil cap, were huge, in-your-face biffs of molasses, licorice and coffee. They were deep and dark and rich and had it not been for the rather raw profile overall, I could be forgiven for thinking the rum was an old Demerara from Enmore, or even a Dictador 20 on steroids. Which is not too surprising, because Woods made a rum here which took the characteristic dark pot still distillates from DDL in Guyana (one source suggests some column distillate is used as well, about which I have my doubts, but okay), aged them in oak for up to three years and then bottled the result without gelding the poor thing to 40%…but remained at a chest-hair-curling 57%. Drink this neat and you’ll feel like a hobbit drinking with Treebeard. So good for them, methinks. The intensity remained, the darkness persisted, in any kind of cocktail the tastes stayed true, and frankly, Navy rums should be a tad more oomphed up than the norm, otherwise they wouldn’t (to my mind anyway) be Navy rums. What about the taste? Well, pretty much what you would expect, all in all (come on, were you really expecting a swan to emerge from an eighteen-quid duckling?). Woods 100 was a dark red, almost black rum — which had been part of the initial attraction for me — poured inkily into the glass, and when sipped conformed as closely to the anticipated profile as one James Bond movie does to another: spicy, rich, dark melange of flavours promised by the nose. And these were the same molasses, burnt sugar, coffee and licorice overtones, which buried the subtler elements as completely as an alpine avalanche. Sure, I found sly and supple hints of chopped fruits, cinnamon, vanilla, ripe cherries and cashews, but not enough to really stand out…the balance was all towards the dominant notes. The finish was, as befitted an overproof, long and lasting, giving more of the molasses and burnt sugar, quite heated and a shade dry. But, of course, with claws. It should be pointed out that I felt the rum teetered on the edge of being medium bodied, because it was harsher on the tongue and one the fade than I had anticipated, thinner (perhaps I’ve been spoiled by El Dorados)…there’s an element of rawness to it, a lack of refinement and couth which points to the short maturation. Still, it’s young, it’s brawny, it’s cheap, it’s not like I should expect a miracle: like any young stud, strength is the selling point, not staying power or finnesse. 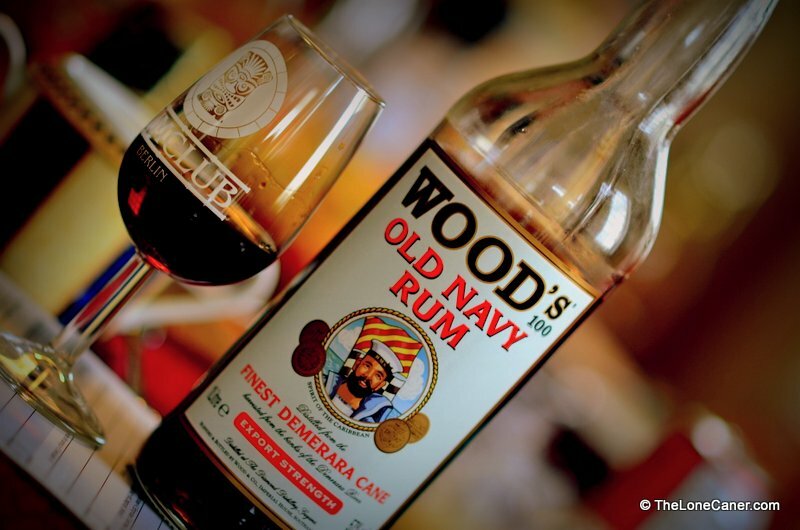 There are many rums like Wood’s on my shelf, which says a lot for my affections when it comes to sweaty, prole-centric, cane-cutter rums I don’t necessarily sip. Cabot Tower 100, Favell, Young’s Old Sam are the first that spring to mind, but also Robert Watson, some of the old Enmores (better made, older and smoother but not quite as cheerily nutso as this ‘un), Pusser’s or Lamb’s. I’d place this one about on par with the Cabot’s (which scored 78). But y’know, Demerara rum seem to be good no matter what, and that is particularly true of the wooden pot still products. Whether they are made to sip and savour (like BBR’s Port Morant 1975 or Bristol Spirits PM 1980) or to get one hammered (all the others named above), they all have that deep, rich fruity molasses note within their variations, and this one stands forward to take its place loudly and proudly (even obnoxiously) among all the others. 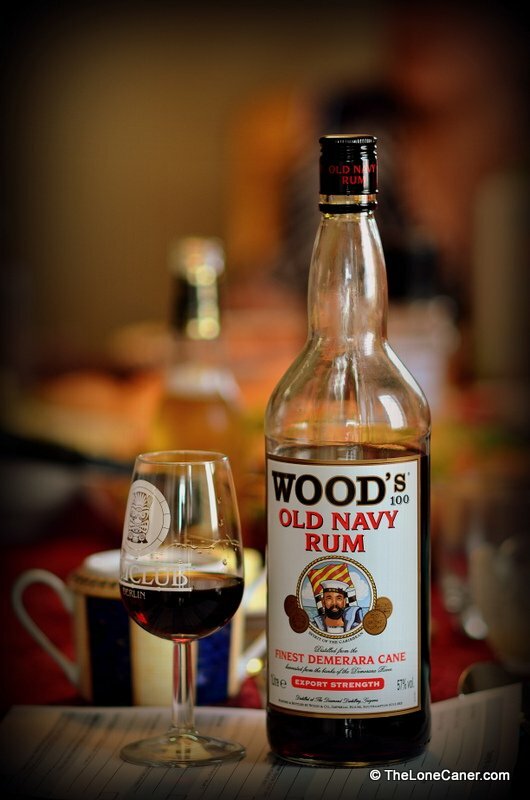 The fact that many online shop-commentaries resound with the plaudits of ex Royal Navy men who esteem Woods above just about any other Navy rum says all, I think, that needs to be said about this cheerful, powerful, unpretentious cask-strength rum. In passing, why name it “100” when it’s actually 114 proof? Well, here I’d refer you to my essay on poofage, but in fine, in the old maritime days, 100 proof was a measure of the least (most diluted) ratio of alcohol to water which would still support the combustion of gunpowder. And that equated to about 57% ABV.